If you're looking for an authentic Thai Tea with a reasonable price, then you can get it now at Mon Chaang Thai Tea & Coffee by Chapayom from only RM4.90. Mon Chaang had just recently opened its 2nd outlet at AEON, Sunway Pyramid. Their first outlet was at Menara Citibank, KL and due to its good response, they had diversified and more outlets coming soon. Mon Chaang Thai Tea & Coffee by Chapayom is the latest Thai Franchise in Malaysia. Using the premium tea leaves which was imported from Thailand itself, Mon Chaang served various flavour of Thai tea at a super affordable prices. 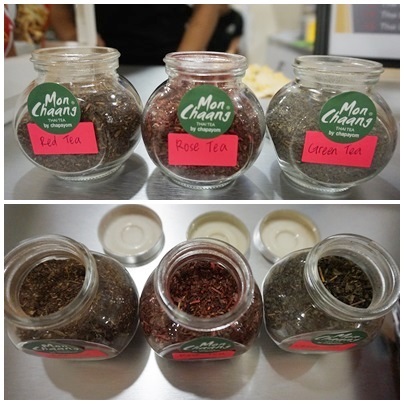 Mon Chaang used 3 types of tea leaves i.e. Red Tea, Rose Tea and Green Tea. Each of the tea leaves had its own unique aroma and flavour. Mon Chaang served 15 different flavours of Thai Tea which can be served in hot and cold. There are Thai Milk Red Tea, Thai Milk Green Tea, Thai Milk Rose Tea, Thai Cocoa (Chocolate), Thai Coca & Tea, Thai Mocha (Coffee & Cocoa), Thai Milk Red Tea & Coffee (Cham), Thai Milk Coffee, Thai Black Coffee, Thai Red Tea and Thai Green Tea. For a cup of 8oz hot tea, the price is at RM4.90. For a cold one with the big size cup of 22oz, the price is at RM5.90. For the Blended Tea, the price is at RM6.90 for 22 oz. If you want to get some halal Thai snack, then add a packet of the snack with any of the drink for a combo price of RM9.90, RM10.90 and RM11.90 or you could alternatively buy a packet of snack at RM5.90. Amongst all the flavours, their signature drinks are Thai Milk Tea, Thai Green Tea, Thai Rose Tea, Thai Milk Red Tea & Coffee (Cham) and Thai Lime Green Tea as the photo below... (From left to right). The Thai Tea is made from strongly brewed premium tea leaves imported from Thai and sweetened with sugar, fresh milk, condensed milk and served over ice which originated locally. It was then stir with a hand mix to ensure the texture had mix well. Check out my video below on how the Pretty Ladies had prepared the Thai Tea to their customers. After trying all the 5 signature drinks, my view is that the quality of the tea is really good. It is thick and creamy. The beverages are flavourful and we can choose the sweetness of our drink. When ordering, just inform the counter lady on the level of sweetness that you preferred. My favourite is the Thai Lime Green Tea and Thai Rose Tea. The Thai Lime Green Tea is similar to our Ice Lime Tea but they used Thai Green Tea instead of the normal tea. Thai Lime Green is refreshing and it is a thirst-quenching drink that perfectly complement to hot weather and spicy food. Thai Rose Tea is flavourful and creamy with rose flavour. It had the rich taste of the Thai Tea. Remember to check out their assorted imported snacks from Thai that you could grab as a combo set to enjoy your drink with. My favourite is the Crispy Fish and BBQ Fish Cracker. There are also their best selling snacks that you got to try it out. Mon Chaang will be officially open on this Saturday, 13th January 2018 at LG2, AEON Sunway Pyramid and they will be giving free drinks for the early bird. Do check out their announcement at Mon Chaang Facebook page at www.facebook.com/monchaang.malaysia and instagram page at www.instagram.com/monchaang. For more photos, check out their official hastags #monchaang #chapayom #thaitea #monchaangthaitea. After trying their 5 signature drinks, Mon Chaang do served delicious tea of variety of variants at an affordable price daily as compared to other Thai Tea beverages in Malaysia. Mommy Jane and Little Angels definitely will go there again to try out other flavours in the menu i.e. Thai Cocoa, Thai Mocha etc. With the wide range of the Thai Tea flavours, we are spoilt by choices at a very cheap price per cup but the most important is the drinks are yummylicious too. wow authentic no color preservatives right ? will try nak cuba looks tasty ! Syafiera, indeed tasty. Do try out their Green tea lime. Refreshing. Wah, I want to try this! Altho I hardly go to these 2 parts of town, but if I drop by, I'll remember to try this :) It looks so yummy & thirst quenching! Yin, indeed it is and the price is reasonable too. Rawlins wants those drinks too! I hope their taste matches the ones that I had in Bangkok. Thanks for sharing the info. Gonna visit the place soon. Rawlins, you're most welcome. Hope you had enjoy your drinks. Hi Ciki, there is coffee for you to try it out. It looks like a great tea and coffee shop. Those Thai tea flavor looks really refreshing and tasty. I love to try this someday. Shub, do enjoy your drinks here. Felicia, you can always have it when you come to KL. This is my first time hearing about Mon Chaang. Also haven't got a chance to visit their stall yet. Hope they expand quickly and soon to Ipoh. Emily, when you come to KL, do try it out. Sienny, do enjoy your drink ya. I remember this brand, met the creator at a Thai Restaurant... finally can get to taste this tea now!! Racheal, yeah... Do enjoy your drink.